Rowena de Jesus’ journey in handcraft took her from exporting handmade paper products (through her company, Spring Sheets Inc., founded in 1996) to the world of home furnishings and decor with the launch of That One Piece ten years later. With the new company, Rowena initially produced lamps before branching out to small furniture, and home accessories. Drop lights made from paper twine and metal frame (top left, top right), design by Dice Ramirez; Lamp with scrap inabel fabrics, wooden cane stand, design by Rowena de Jesus; Bee sconces, made from fabric and metal frame, design by Detlef Klatt. The new collection, marketed under a Rowena’s new brand name, Liha by That One Piece, reflected the company’ rustic yet modern vibe. Its creators, however, conveyed a whimsical narrative that gave the pieces their charm. 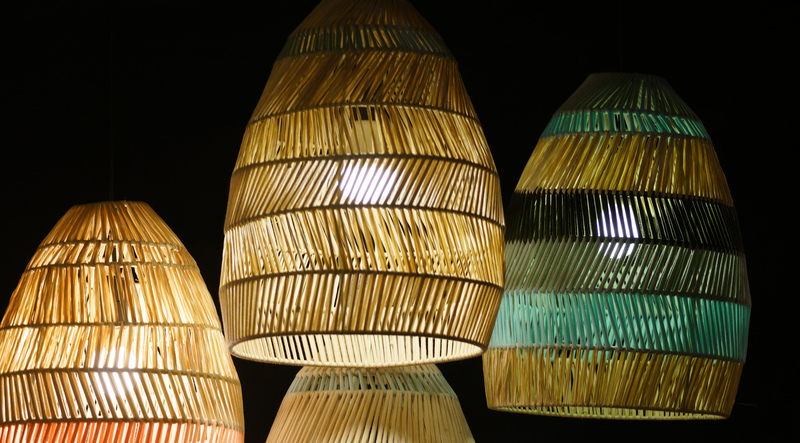 Beehive droplights made from metal and fabric, design by Detlef Klatt and Tes Pasola. At the fair, a colony of bee sconces decorate a wall; nearby, colorful bee hive drop lights anchor a setting. Rowena’s own designs - bamboo bird cages accented with fabric strips - complete the mood and look the company has become known for. Top photo: Bamboo bird cages with fabric accents, design by Rowena de Jesus.